Sugary Cherry is a cherry tomato that produces intensely sweet, deep red, oblong tomatoes with a distict point on the end of the fruit. It has been recognized for outstanding flavor, productivity and vigor. Needs well-drained soil in full sun. Eat fresh for a delicious and nutritious snack. Perfect for grilling on kebab skewers. Serve with dip on a vegetable tray. Use in salad or stews. Regular consumption of tomato reduces cholesterol by decreasing the levels of LDL cholesterol and triglycerides in the blood. 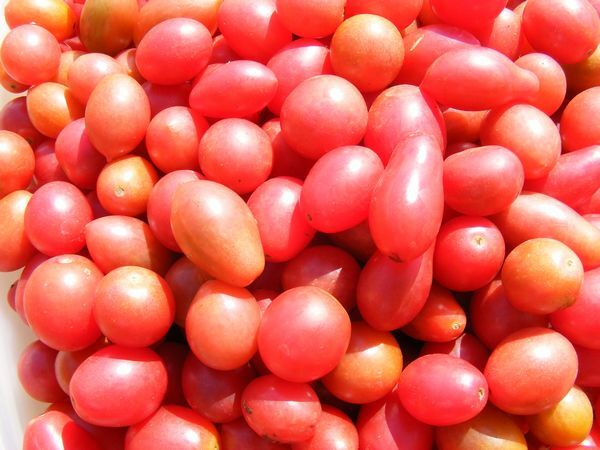 The lycopene in tomato is a carotenoid and an antioxidant - it protects the heart against cardiovascular diseases by preventing serum lipid oxidation. Contains large amounts of vitamin C, vitamin A, potassium and iron. Potassium plays a vital role in maintaining nerve health and iron is essential for maintaining normal blood health. Contains small amounts of vitamin E, the B vitamins, thiamine, copper, phosphorus, magnesium, niacin and folate. Also contains Vitamin K which is essential in blood clotting and controls bleeding. Counters the effect of cigarette smoke - it contains coumaric acid and chlorogenic acid that fight against nitrosamines which are produced in the body and are the main carcinogens found in cigarette smoke. Vitamin A aids in improving vision, preventing night-blindness and macular degeneration. Tomato keeps the digestive system (gut) healthy by preventing both constipation and diarrhea, prevents jaundice and removes toxins from the body. It reduces the risk of developing hypertension and alleviates diabetes by reducing the oxidative stress in type 2 diabetes. Aids in maintaining healthy teeth, bones, hair and skin. Reduces urinary tract infections and bladder cancer.